Bands always say they want their music to speak for itself. And, for any serious group, that’s completely true. The music is what matters most. But you also need an interesting story to sell your band: to fans, to radio, to music magazines, to anything and everything internet related. This is part of the music-biz game. A good story needs a good angle, and that a good band makes good music isn’t one of those angles. Plenty of good bands make good music. People want something to talk about. So if you want to get your music heard, one of the best ways is to have an interesting story that engages folks, that separates you from the pack. The RocknRoll Hi-Fives are a good band that plays good music. Their backstory, however, is great. Other bands would kill for their backstory. It’s the defacto first paragraph of anything written about them. Except for the bio the Jersey quartet’s publicist uses to promote them. This is how that starts: “The RocknRoll Hi-Fives are a rock band. Any other descriptive adjectives—while they may be accurate—are unnecessary.” Music-wise, that says it all. 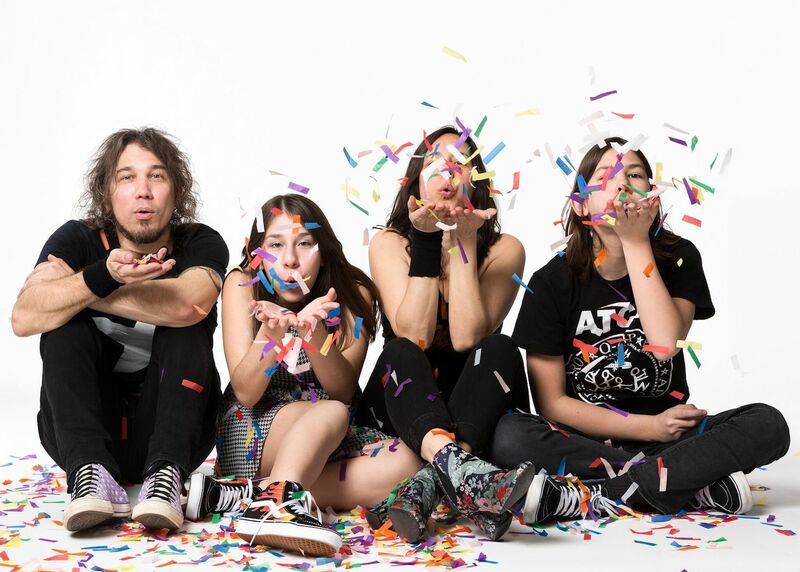 These guys and gals are a catchy, energetic mixture of late-’70s/early-’80s female-fronted, punk-inspired pop/rock that also embraces the next decade’s indie-rock music inspired by that. Think Kim Deal or Corin Tucker fronting the Runaways. Or, better yet, instead of thinking, listen to the RocknRoll Hi-Fives. We’re proud to premiere “C’est La Vie,” off Re-Introducing The RocknRoll Hi-Fives (Little Dickman, June 29), today on magnetmagazine.com. Says vocalist Eilee Centeno of the track, “One day [guitarist Joe Centeno] walked into my room playing his guitar, singing the words ‘C’est la vie,’ and jokingly I sang back to him, ‘Hasta la vista, baby.’ He thought that was funny and a perfect response, so we built the song around that, which became part of the chorus. The song is about having fond memories of building a strong bond with people or places that is short-lived.” It’s also a hell of a good song. As for the RocknRoll Hi-Fives’ backstory that other bands would kill for? If you’re interested, it’s easy enough to find out what it is on your own. Pre-order Re-Introducing here, and check out the band on tour this summer. Dates are below.